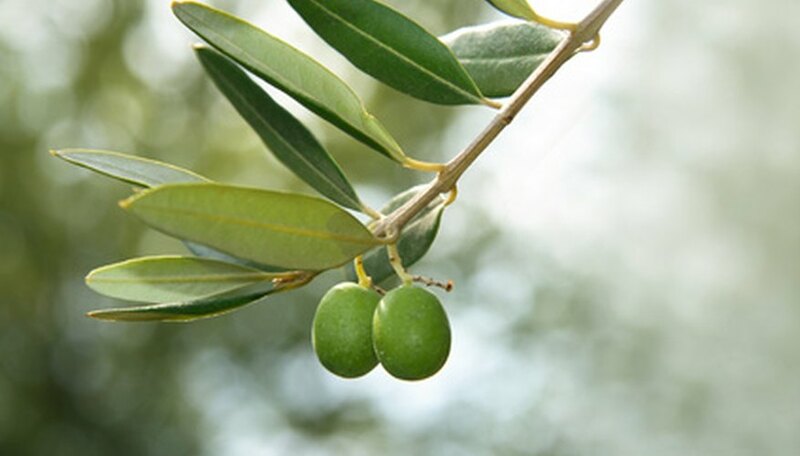 Olives grow on evergreen trees that can reach 50 feet in height. Olive trees need a long, hot growing season, which is why most of the United States’ commercial olive production takes place in California, according to experts at California Rare Fruit Growers. Olive trees are not difficult to propagate from cuttings. It will take the new tree four years to begin bearing fruit. Take your cutting in August or September. Cut an 8-inch length of branch from the olive tree. The cutting should be the diameter of a pencil. Fill a planting pot with equal parts perlite and sand. Moisten the planting medium until the water runs from the bottom of the pot. Allow the pot to drain completely, then use your finger or a pencil to poke a planting hole in the soil. Remove all leaves from the bottom half of the cutting. Dip the bottom inch of the cutting into the rooting hormone. Stick the hormone-tipped end of the cutting into the prepared planting hole and pack the soil around it. Stick wooden craft sticks or skewers into the soil around the edge of the pot and place the pot in a plastic bag. Adjust the bag over the sticks so that the plastic doesn't touch the foliage on the cutting, then close the bag. Place the pot in an area that remains at at least 60 degrees Fahrenheit. The cuttings should root within eight weeks.